Examining when cash is recovered via a missed loan payment is a great way to understand how effective each piece of the recovery process is in the effort to recover payments which may have otherwise been written-off. This cash recovery process is a key factor in maintaining high returns for investors. **Please note, to maintain accurate data, we attempt to assign all recovery payments to a specific recovery stage. As a standard, we set the stage assigned to the recovery at the stage closest to the payment date. This approach will never be 100% accurate, but it provides the best overview of what is causing recovery payments and allows us to gain better insight into our recovery process. 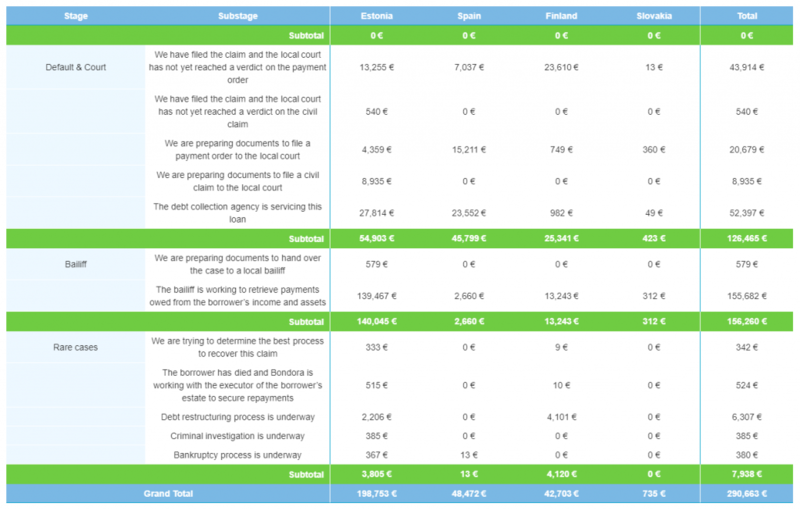 Bondora obtained €291,093 in recovery payments over the month of October, a slight increase compared to the previous month. Recoveries across Estonia and Spain led the increase, while recoveries in Finland were the only country on the month which declined, falling to €43,133 on the month. Recoveries in Estonia were the highest in the bailiff stage, while recoveries in Spain, Finland, and Slovakia were highest in when dealt with in the default & court stage of recovery. More specifically, recoveries in Spain serviced by debt collection agencies saw the most recoveries (€23,552), while in Finland the first step of filing a claim with the local court resulted in the most significant amount of recoveries (€23,610).r be 100% accurate, but it provides the best overview of what is causing recovery payments and allows us to gain better insight into our recovery process. While recoveries in the default and court stage declined, recoveries resulting from bailiff intervention increased by 11.5% to €156,690. This follows a similar trend as the previous month and is a positive sign that bailiff intervention is playing a positive role in obtaining missed payments from borrowers. Recovering payment in the case of borrower criminal activity, death, or other rare cases is difficult. However, a decrease in these numbers could be a positive sign for Bondora investors. Recovery in the case of borrower death was a paltry €524 on the month, which could potentially be a result of a decrease in borrower deaths over this period. Another interesting decrease in rare case recoveries is in the initial stage of attempting to determine the best process to recover the claim. In this initial phase of the rare case stage, recoveries were down 92.8% to €342 total. Compare this significant decrease to the aforementioned 11.5% increase in recoveries as a result of bailiff intervention, and it is possible this decrease in rare case recovery is because bailiff intervention is resulting in more payment recoveries, and therefore, fewer payments are reaching the rare case stage. We always do our best to seek out methodologies which will lead to the highest likelihood of payment recovery. Over time, we at Bondora have become extremely familiar with the local courts and authorities in the countries in which we provide lending, allowing us to increase our effectiveness at recovering missed loan payments.